Throughout the ages, humanity has wondered if life exists on planets other than Earth. But if life were to be found, would curious mankind jump at the chance to venture into the unknown and meet the aliens (even if they looked like stereotypical Martians with antennas)? 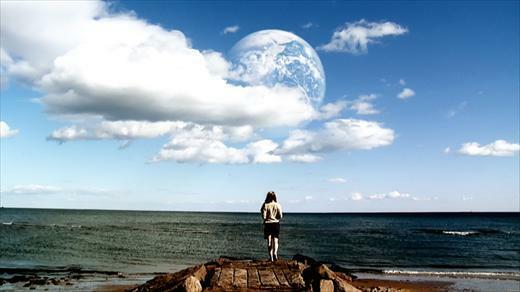 Despite contemplating these issues (well maybe not the Martians bit), the indie movie Another Earth is not about the convergence of humanity with aliens. Rather, it is a story of regret and the need for redemption. Rhoda (Brit Marling) sitting on her own in her room. This is how she spends much of her time when she is not working. The film centres round a promising young girl, called Rhoda (Brit Marling – Political Disasters, Sound Of My Voice, The East), who lives in New Haven, Connecticut. After getting accepted to MIT, seventeen year old Rhoda goes to a party and gets drunk. That night, as she is driving home, well over the alcohol limit, it is announced on the radio that another planet, identical to Earth, has been spotted in the sky. (It is also believed that as there is an ‘Earth II’, there is a ‘twin’ of everyone on Earth proper.) Whilst driving drunk and looking at the luminous sapphire dot in the sky, Rhoda crashes into another car, injuring a music composer, John Burrows (William Mapother – Mission: Impossible II, The Grudge, Static), and killing his wife and infant son. Four years later, Rhoda is released from prison. Her life seemingly ruined, she spends much time by herself, longing for redemption and a second chance. She tries to apologise to John for the misery she has caused him, but loses her nerve upon meeting him. Rhoda’s dream is to go to ‘Earth II.’ When she learns of a competition to go there, Rhoda writes in, hoping that she will be chosen so she can start again. The storyline for Another Earth is easy to follow for the most part. It is only the space travel/time travel at the end (a tricky matter that so often goes badly wrong in movies, such as Déjà Vu and The Time Traveller’s Wife) that might confuse viewers. That it works in this film is a credit to director Mike Cahill. 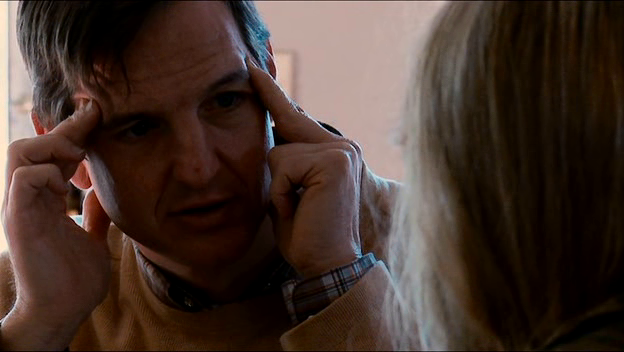 John (William Mapother) talking with Rhoda. He doesn't realise who she is. At 92 minutes, Another Earth is not long and has been made in an interesting way. Unlike Jeff Nichols’s art-style choice for Take Shelter, Cahill chose well by adopting an amateur, arty approach for his movie. One may find it irritating that the camera trembles and goes out of focus every so often, and that scenes jerk harshly from one to the next. In addition, one may find it odd that there is little dialogue throughout the film (although, there is considerably more in the latter stages of the film than at the beginning). However, if the movie had been shot in a more conformist way, it would have risked becoming laughable (as what happened with Fantastic Four I & II and The Adjustment Bureau, amongst countless other films). The film has its deficiencies, but the acting is not one of them. Whilst not memorable either, Brit Marling and William Mapother play decently with what they’ve been given, and both perform admirably in one particular scene. It is hard to appreciate the effect that killing John’s family, jail and the crushing of her original ambitions (whatever they were) has had on Rhoda. This is because for much of her time on screen Rhoda is alone in silence, entailing that one doesn’t feel much empathy for her plight. Only the lack of happiness on her face, devouring her of her attractiveness, gives us a hint into Rhoda’s suffering and her need for salvation. Marling pulls this all off well. Rhoda looking at the magnificent 'Earth II' in the sky. She yearns to somehow get there and start anew.. In contrast, it is not difficult to have sympathy for John. That John’s a mess emphasises, more than words could, that John has not recovered from the loss of his family. That John is quite distant and says little at first rams home this point. Mapother performs John’s aloofness, sorrow, temper and tenderness with great professionalism. All-in-all, Another Earth is an interesting premise and an unconventional film. It may have relatively few conversations and be far from action packed; yet, it has some decent performances and is something different. Furthermore, the movie has a comforting moral message, for there are times when one needs a second chance in life. This entry was posted in Indie and tagged 'Earth II', another earth, brit marling, deja vu, film, Indie movie, review, reviews, the adjustment bureau, the time traveller's wife, time travel, william mapother. Bookmark the permalink.